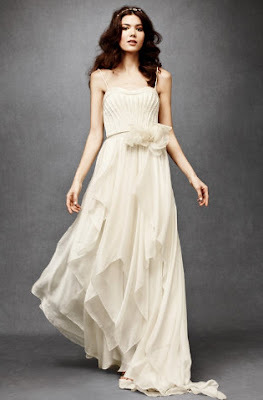 Be a carefree, bohemian goddess in this Cascading Goddess Gown. Light, airy, and flowing, this dress suits Jen's relaxed and romantic style and is perfect for an outdoor garden or beach wedding. 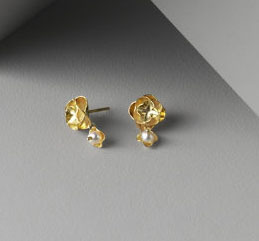 Sweet and delicate, these tiny gold floral studs, accented with freshwater pearls, are the perfect understated accessory to the whimsical and enchanting gown above. These bronze shoes, with pretty floral cutouts, go along nicely with the gold and cream tones to create a look that is earthy and ethereal. 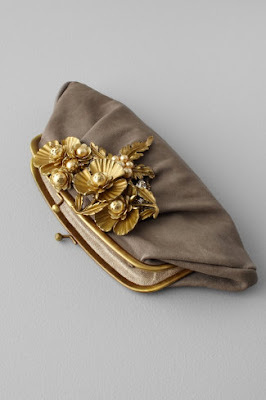 Sticking to neutrals, this kisslock clutch is just the right combination of bohemian and romantic with its brass, kind of rustic looking, floral and pearl applique and soft, muted taupe/grey color . Why should the bride get to have all the fun? This blush pink dress would compliment the bohemian bride nicely and add a subtle pop of color to the ensemble. This dress is features beautiful sequins, velvet, and fun appliques all in a silhouette that is practical and a material that is light and comfortable.